adult charter cruises and student school visits. Please contact the Connecticut River Museum to schedule your personalized experience and reserve your sail early. Charters run 7 days a week. Public cruises run from June 1st through September 30th and sail from Thursday through Monday. Thursdays on the Dock with special themed cruises aboard Onrust. ​ Grade K-2: River Discovery, Living with the River, Big Birds of Winter/Eagles of Essex. Bushnell's Turtle Submarine: Innovation and Revolution, Colonial Life Immersion Day. Onrust dockside programs at Kingston waterfront with hands-on activities on deck. designed for Hudson Valley fourth graders, serving about 800 students per year. and seamanship needed on an early 17th exploration vessel. Dockside tours and cannon salutes to celebrate more than 400 years of Dutch heritage in the Hudson River Valley! ​ in Essex, CT, for its second season. New Netherland region, charted by captain Adriaen Block, the first European to explore the River. the Connecticut River and its Valley”. OCTOBER 23-27/2017 Fall Field Trip Adventure for Capital Region Schools! seamanship, and about work and life aboard the Onrust. Includes visit to Dutch House Museum at Crailo State Historic Site, Rensselaer. available through the "Connect Kids to Parks Program" From New York Parks. ONRUST 2017 participation in Sinterklaas Event cancelled! Due to work being performed on the ship at Scarano Boat Builders in the Port of Albany, Onrust will not make it back to the Hudson River Maritime Museum dock in time this season to participate in celebrating the event. We very much regret not being there but hope to welcome you onboard the ship in future years! JOIN US FOR THE GRAND "SINTERKLAAS" CELEBRATION IN KINGSTON AND TOUR THE ONRUST! Saturday, Nov 25th, Hudson River Maritime Museum. Every year brings new events and characters to dazzle the community and honor the children and bring light to the darkest time of the year. The Sinterklaas Festivities draw on the Hudson Valley’s Dutch heritage, but with some modern day twists." COME AND JOIN THE FUN! ​ A fun learning experience on the Onrust, an authentic working replica of a 17th century exploration vessel, the only floating museum of Dutch maritime history in the state. Through hands-on activities students learn about the skills and seamanship needed to become a successful merchant sailor and travel back in time and learn about Captain Adriaen Block, his first trading contracts with the Natives, the first New York State maps, and work and life aboard the Onrust. On the same Hudson River banks they also explore the private rooms of a unique Dutch house museum, learn about the region’s first settlers, their contact with the Natives and discover one of the oldest and most treasured collections of Dutch artifacts in the state. Recommended for 4th – 7th graders. Draken Harald Harfagre coming out of Waterford Lock 2 under cannon salute then cozying up to Onrust’s lion figurehead. While comparing building methods, we scored highest with him for Onrust ambiance below deck quarters and authentic recreation of early Dutch 17th vessel, and for tasty Onrust signature “keel beer”! We offered one of the well-known local brews, Ommegang’s Hennepin, the beer also used for Onrust keel laying and ship’s launch. Visitors were many, including Jack McEneny and Mayor of Waterford, Bert Mahoney. And! Twenty- seven member- crew voted our dinner treat so far their top choice meal since April departure from Norway! Thanks to Barbara Maffeo, Suzanna Hunter and Barb Lomnes for contributions and last minute speedy delivery by Cardona’s, Albany! And to Howard Van Deusen for exhibiting upon short notice the models he crafted of the Onrust and the Viking longboat (in progress). The blue prints he used for the Viking ship, were obtained while traveling to the well-known Kultur Historisk Museum in Oslo, Norway, which exhibits the original long boats excavated both at the “Osseberg” and “Gokstad” sites, on which the “Draken” design was based. Join us for a narrated tour on the Hudson River and help steer an historic 17th century replica yacht, raise the sails and fire one of the six Onrust cannon. Narration and entertainment by Tom Benson, multiple instrumentalist and vocalist. Light breakfast items served, including Belgian waffles. Boarding at 9.15 am at the Waterford Harbor Visitor Center docks, One Tugboat Alley, Waterford, NY 12188. Tickets are $39 each. For more information and additional times, please email theonrustproject@gmail.com or call 518.248.1395. WATERFORD STEAMBOAT MEET FESTIVAL, SATURDAY JULY 2, 9.30 - 7 pm. 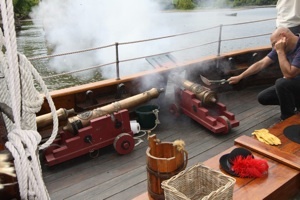 Harbor Visitor Center, Waterford, NY: ONRUST dockside tours, demonstrations, cannon firing. . Free to the Public. Antique steamboats, vendors, refreshments, entertainment, and fireworks sponsored by the Town of Waterford. June 19: DOCKSIDE TOURS including cannon firing at HRRM docks on FATHER’S DAY, from noon to 4pm. Onrust has been transformed into a remarkable floating museum with both, original early 17th century and replicated artifacts with an important Hudson Valley relevance. ​ COME ABOARD THE ONRUST! One way to support the Onrust programs and visit the ship is to participate in HRMM’s Hudson River Festival on the weekend of June 24-26th in Kingston. Onrust provides eight two-hour excursions including free dockside tours before and after excursions during Hudson River Day on Saturday June 25th. Take a day off and enjoy an historic excursion on the Hudson River. Learn about Adriaen Block, experience the life of a seventeenth century sailor, and discover the skills of early Dutch shipwrights. Help us fire the cannon and enjoy the flavors of Dutch cheese and locally produced foods and drinks: Onrust’s signature Luikse waffles, sweet cider and beer tastings. Visit historic Kingston, the Hudson River Maritime Museum, its new Riverport Wooden Boat School and one of the many waterfront restaurants, while enjoying a scenic tour on the beautiful Hudson! • 1 pm to 3 pm Afternoon Cruise - SOLD OUT! • 4 pm to 6 pm - "A Toast to Adriaen Block"
• 7 pm to 9 pm - "Sunset Cruise"
Saturday, June 25th - HUDSON RIVER DAY! • 10:30 am to 12:30 pm - "Brunch on the Hudson"
• 5 pm to 7 pm - "A Toast to Adriaen Block"
• 11 am to 1 pm - "Brunch on the Hudson"
• 2 pm to 4 pm - "A Toast to Adriaen Block"
• 5 pm to 7 pm - "Sunset Cruise"
Private Charter Cruises are available on Sunday June 26 and Monday June 27. Other dates available upon request. Please contact theonrustproject@gmail.com or call 518-248-1395 for additional charter information. June 28th: Onrust returns from Kingston to the Albany area. 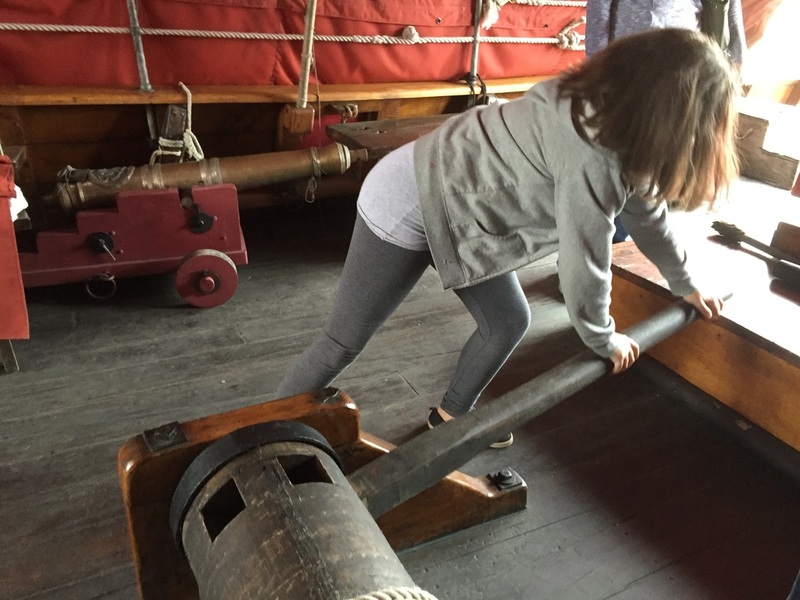 Please join us for the journey north: learn to steer the ship, handle the sails, lower the mast and guide the ship through the Troy Federal Lock on to its destination at the Waterford Harbor Visitor Center (One Tugboat Alley, Waterford NY). (9 am – 6pm) Please call 518-248-1395 if you can volunteer. 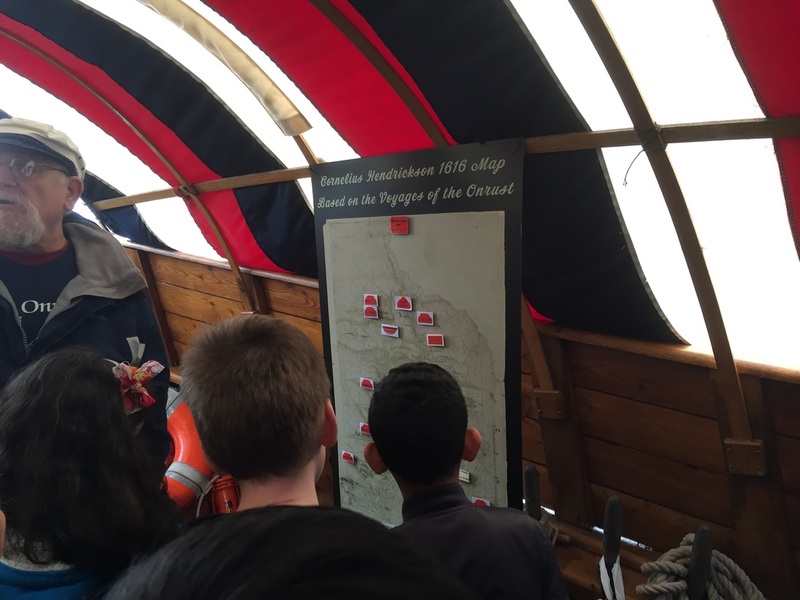 After spending the winter at the Hudson River Maritime Museum (HRMM) docks in Kingston NY, ONRUST participated in HRMM’S HUDSON RIVER STEWARDS PROGRAM for Hudson Valley fourth graders. 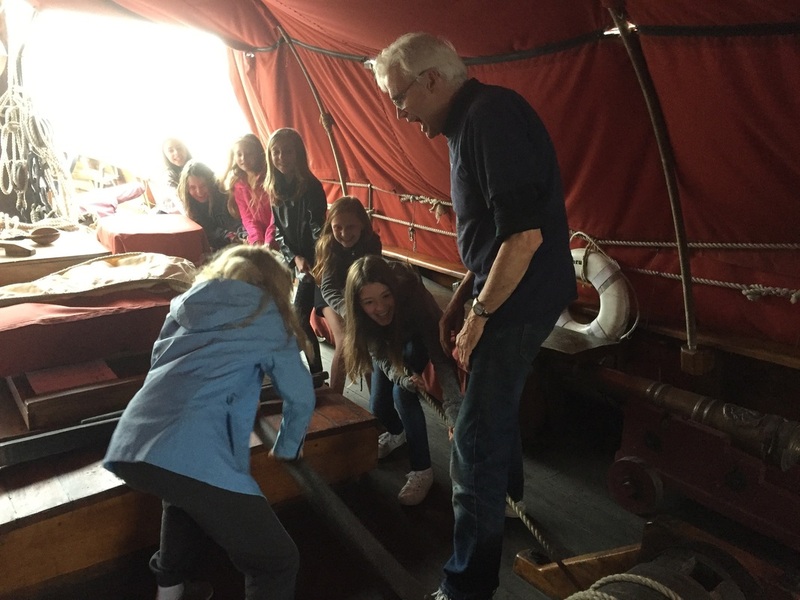 Close to 800 students boarded the ship to learn about early Dutch exploration and trade in New York State as well as 17th century navigational skills, seamanship and shipbuilding. May 20 -21: ONRUST functioned as historical Hudson River back-drop for MARIST COLLEGE GRADUATION CEREMONY. A Celebratory Welcome and Send-Off for 70th Commencement Exercises on the Campus Green. Onrust, under full sails, engaged all six cannon to salute Marist’s 5,500 plus graduates.